It is a common place that nobody can expose exactly geometrical structure of the Sri Yantra performed through instruments: ruler, compass, 0.3 mm pencil etc. I don’t name computer between the tools because it was not a primary implement for the geometrical art of yantra. Those illustrations modern readers can see in one book or another are only a feeble echo of possibly calculated solution and splendid view. Thus we cannot go further in our preview of mathematical idea if we shall not name the main details have been lying in a base of Sri Yantra’s construction. Traditionally we begin to move from outside to the centre. The first sacred geometrical figure is Bhupura, or a square with four gates. It has double (usually) or triple line, colour or colourless. It can resemble a double svastika, if it will consist of eight prolonged bulges on four sides of the Bhupura. The second principal figure is Mekhala, or triple concentrical circles (color or colorless) usually had been drawing without a compass. The area being defined between Bhupura and Mekhala has own name, the first from chakras: Traylokya-mohana chakra, or Enchantress of the Triple World. It is usually yellow on the whole, or one gate is white (down, East), another is blue (right, North), and two others are yellow (up and left, West and South). Inside and outside the first chakra there are many pictures of the gods, goddesses, and sacral animals on the original hand-painted Indian copies. The next two following chakras are Sarva-saparipuraka and Sarva-sankshobhana. Very often researchers these lotus petals don’t carry mathematical gist and can be any size, that is wrong point of view. Mathematical calculations cover the every line, circle, corner, every dot inside chakra. These two chakras consist of two rings of sixteen (first, outer, blue) lotus petals and eight (second, inner, red) lotus petals , indicating fulfilment of desire. Inner part of the petal also can carry images of recurring deities, Fig. 2 and 3. The first chakra consisting of outer rim of 14 blue triangles on Fig. 3 (left) is Sarva-saubhagyadayaka chakra, or Giver of Auspiciousness, or Provider of All Prosperity. It is a 14-pointed star polygon from 6 interlocking big triangles with parallel bases inside the mandala. The second chakra consisting of 10 red triangles (Fig. 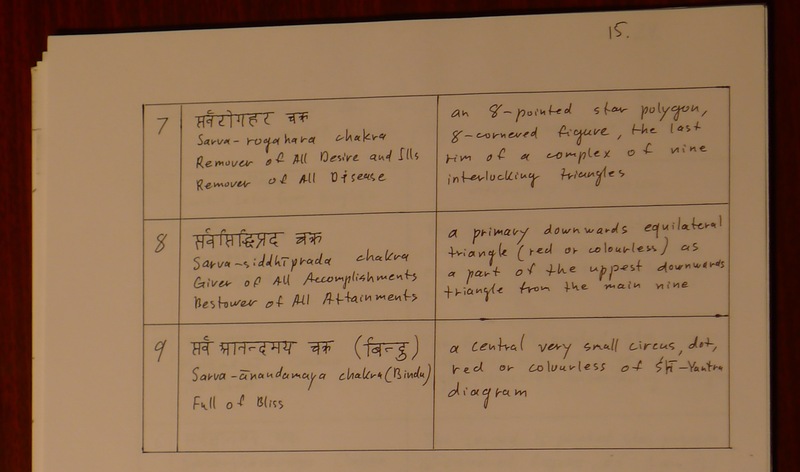 3, right) is Sarvartha-sadhaka chakra, or Accomplisher of All Purpose, or Accomplisher of All Objects. It is a 10-pointed star polygon had been bearing by 6 primary big interlocking triangles. The third yantra is Sarva-rakshakara chakra, or Giver of Protection, or Protector of All. There are two smaller triangles inside commencing six big triangles. It is again 10-pointed (inner) star polygon (Fig. 4, right, blue polygon). The fourth yantra consisting of eight triangles is Sarva-rogahara chakra, or Remover of All Deceases, or Remover of All desires and Ills. This is an 8-pointed star polygon having up-down asymmetry (Fig.4, left, red polygon). The fifth yantra is Sarva-siddhiprada chakra, or Giver of All Accomplishments, or Bestower of All Attainments. 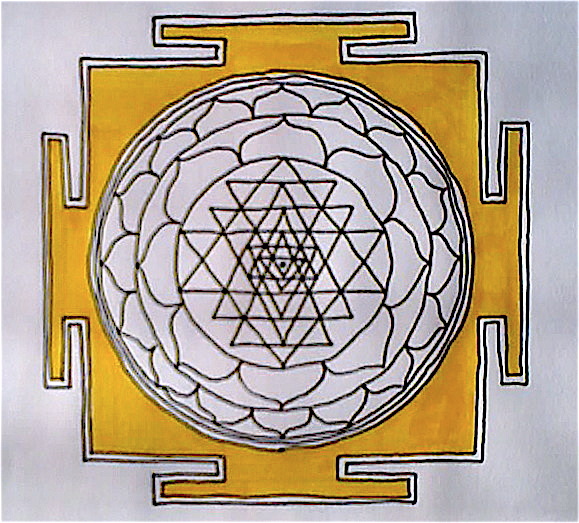 This is an inverted (usually colorless) triangle in the centre of Sri Yantra with the apex facing East (hanging downward when it is drawn on paper or cloth). It is a female principle symbolizing the creative generatrix of the cosmos, yoni-mandala (Fig. 4, left, a small red triangle). The ninth and last chakra in the short preview of Sri Yantra composition is Sarva-anandamaya chakra, or Full of Bliss. This is a red dot Bindu in the centre of Sarva-siddhiprada chakra (Mula-trikona, primary triangle, female principle, colorless). Last chakra, the red dot, is a male principle symbolizing the static aspect of the cosmos, male seed of Being, the state of supreme joy (Fig. 4, right, a small red circle). Fig. 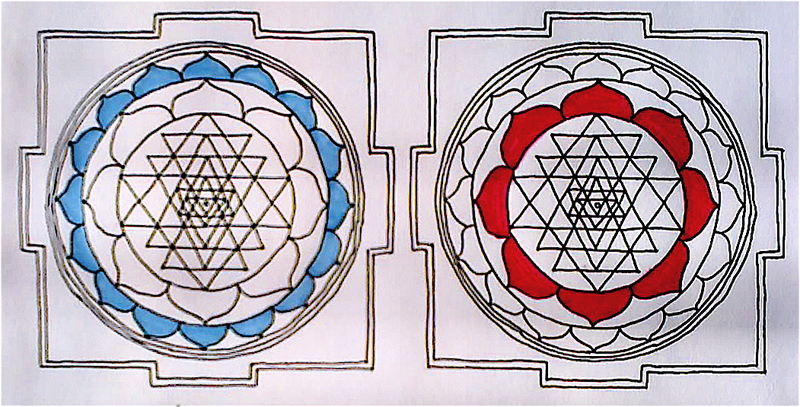 4 Sarva-rakshakara chakra (right, blue polygon), Sarva-rogahara chakra (left, red polygon), Sarva-siddhiprada chakra (left, a small red triangle), and Sarva-anandamaya chakra (right, a small red circle). It is a problem now that the key algorithm for this art and results of its implementation have been still undiscovered for public eyes by the time when the main requirements had been obviously formulated (1994-2011). I would like to underline the fact that I don’t consider computers’ printouts as art of Sri Yantra, and I bother the less (men’she vsego?) about the zooming existing hand-drawn art works to find inner defects in composition. A trained programer or a mathematician with a special computer program aren’t Sri Yantra masters. They just mathematicians and programers exactly in the quantity statistics of the USA or other countries can show in annual reports. It isn’t a subject for discussion of present review at all. The path of master is the master himself as he is. The master can get a virus and die. The Sri Yantra drawing can be lost or broken. The mathematical principle of Sri Yantra art is beautiful as is and absolutely unbroken by politicians, presidents, business visionaries, bankers, warlords, gangs, terrorists, religious fanatics, maniacs, and all sort of freaks. It is not a Rig Veda level but after that relief we can definitely come up to discovery of algorithm directly.